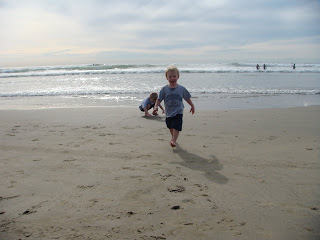 My mom, sister, the boys, and I headed down to Southern California at the beginning of December. We spent 4 days there and stayed plenty busy. 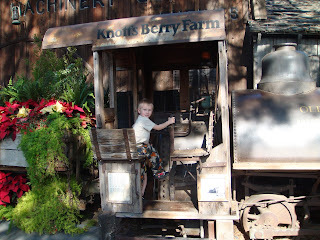 One of our first stops was to Knotts Berry Farm!!! The boys had a blast! We were there not long after it opened and left right before they closed. As most of you may know, the boys love trains! So it was fitting that they got to ride a few and even allowed me to take a picture of them on one! 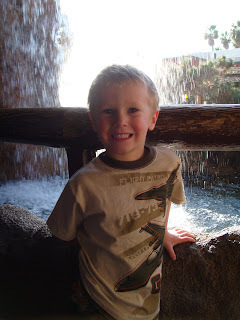 Here's a picture of Landon waiting in line for the Log Ride. Him and Dawson loved it! All Landon wanted to do was ride a roller coaster. We searched and searched! We even found one on the map, but we could not find the children's roller coaster. 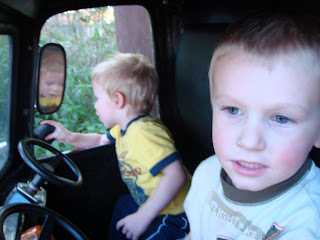 Finally, we found it hidden around a corner & the boys were able to ride the coaster twice. 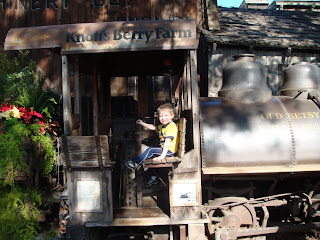 That along with the Log Ride were their favorite attractions at Knott's Berry Farm! 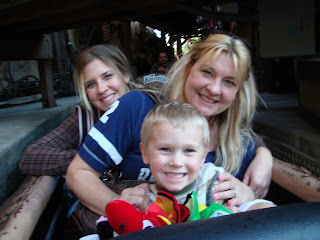 Pictures of us on the Log Ride! This is one of my favorite pictures of the boys. I think it is kind of cool how you can see Dawson's reflection in the mirror! This was a big rig truck ride that they drove and I sat in the back. Rides are so much more fun when you are a kid! 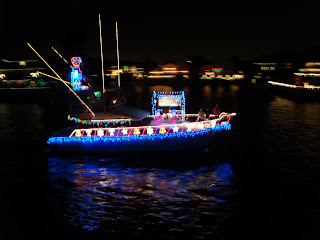 This was the night after our big day at Knott's. I had to take a picture of them passed out. I had to literally pry them apart. It was too cute! I just wish they would always get along like this! What can I say about the beach?!? I LOVE IT! I could easily be a beachbum! Life is just different at the beach. 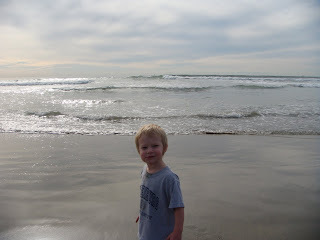 Dawson was having fun until a wave knocked him down and completely soaked the front of him! Of coarse, the clean, dry clothes were in the car far far away. Also, me being the prepared mother that I am forgot the towels at my grandma's house. I am so fired. This nice gentleman taking pictures of the surfers let us borrow his towel so that was nice. 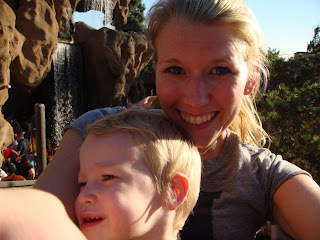 Landon and I got soaked and we loved every single minute of it. 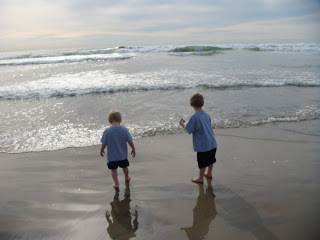 We were searching for seashells and jumping waves! Again, what can I say about the beach. 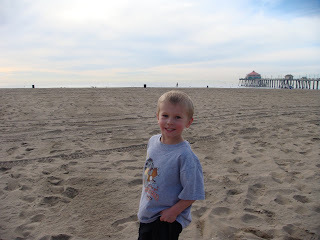 Did you know that Huntington Beach is now known as Surf City USA like the song? Me neither. 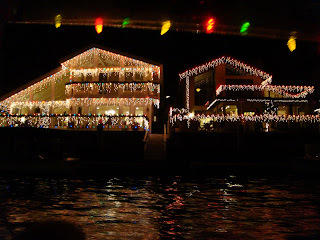 My sister and I loved going to our Grandma & Papa's house for the boat parade every year. 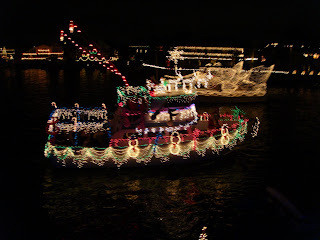 It is so much fun to watch all of these boats go to the limits with lights, music, animations, etc. This year was no different. 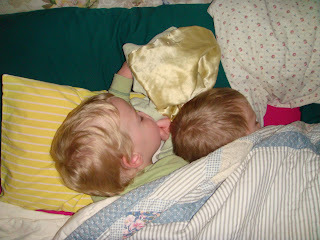 I think the boys enjoyed it as much as I did when I was a wee one. 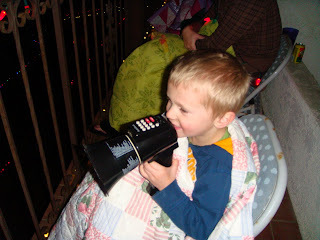 Landon really enjoyed using the blow horn to tell all of the boats passing by "Merry Christmas Mommy". He thinks he is so funny! 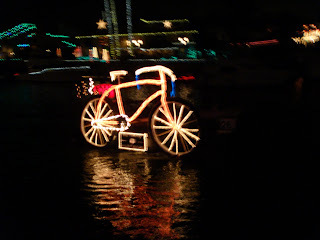 The boys' favorite boat was the one that looks like a bicycle. The wheels even turned on it. It's hard to believe that there is a boat attached to it. What imagination and talent some people have! 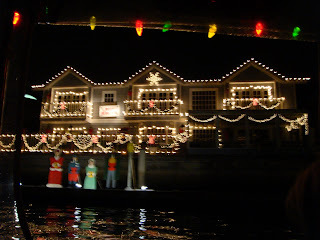 Last but not least was us actually going out on the small boat or "duffy" and looking at all of the houses on the water. 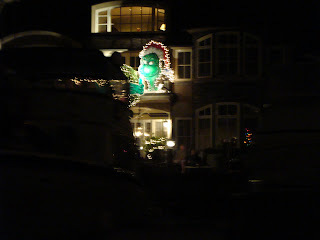 It is actually more popular for people to decorate their back yards and the back of their homes than the front. 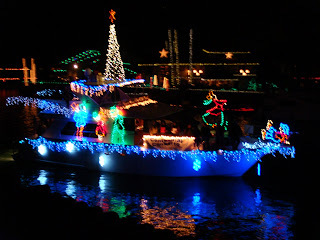 That way all of the people on the harbor can enjoy them like we did! 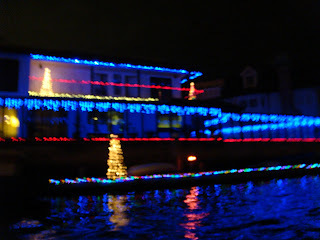 Here are a couple of the houses that stood out (and that my camera didn't make too blurry to enjoy). The first picture is of the back of my Grandparent's house!